Simona Halep became world number one for the first time by beating 2017 French Open champion Jelena Ostapenko to reach the final of the China Open. The Romanian star became the 25th world number one since Women's Tennis Association (WTA) began producing rankings in November 1975. The WTA was formed under the leadership of Tennis legend Billie Jean King on 20th June 1973, a week before the All England Championships at Wimbledon. Months preceding the formation - known as the Summer of Discontent - were witness to some of the most controversial events in Tennis history. The women made less than half of what the men were paid. At times, women were paid a bonus of $15,000 when the men were paid $1 million. Billie Jean King and 8 of her colleagues formed the Virginia Slims Circuit with the support of Gladys Heldman, the founder of the World Tennis Magazine in 1970. This became the precursor to what is now known as WTA. As Halep became the 25th woman to hold the coveted world number one tag, let's look at 5 of the best players to have been crowned world number one. Quite simply, the best woman Tennis player ever! In 1999, Billie Jean King said, "Steffi is definitely the greatest women's tennis player of all time". Chris Evert (who features later on this list) once said, "Steffi Graf is the best all-around player. Martina [Navratilova] won more on fast courts and I won more on slow courts, but Steffi came along and won more titles on both surfaces." That's as big a compliment as it can get. 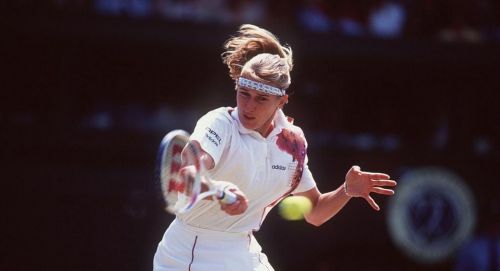 Steffi Graf, on her day, was beyond unplayable. She was adept with both her forehand and her backhand, but it was her forehand that stood out. She generated so much pace that often the ball flew past her opponents before they could react. It also was so accurate that it allowed her to 'hit the lines' often. The German combined power, grace and movement to deadly effect. Her serve, once clocked at 108 miles an hour, remains one the fastest serves in the women's game. Steffi won a total of 22 Grand Slams before retiring at a rather young age of 30. She holds the record for being the world number one for a total of 377 weeks. She also holds the record of being the world number one consecutively for 186 weeks jointly with Serena Williams (also on this list). Graf, who prefers to be called Stefanie, remains the only player, male or female, to have won the calendar-year Grand Slam on three surfaces or to have won each Grand Slam at least four times. She reached the finals of 13 consecutive Majors, a record. She also completed the Golden Slam when she won all the Majors (the Australian Open, the French Open, All England Championships at Wimbledon and the American Open) along with the Olympic Gold in 1988. Simply the best!